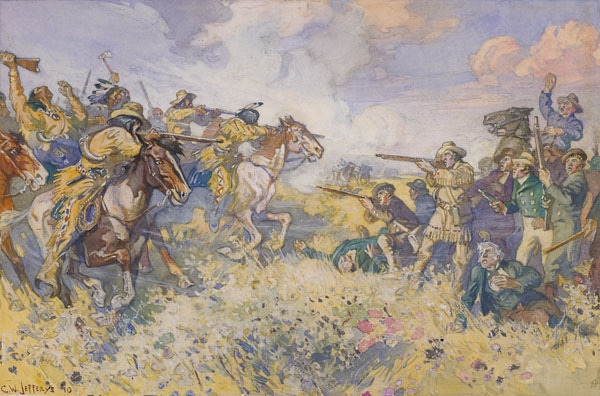 The fight of Seven Oaks was the climax of the conflict between the rival fur-trading associations, the Hudson's Bay Company and the North-West Company. 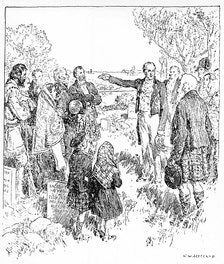 Lord Selkirk had become one of the largest shareholders in the Hudson's Bay Company, and secured a grant of land on the Red River where in 1812 he established a colony of settlers from Scotland and Ireland. 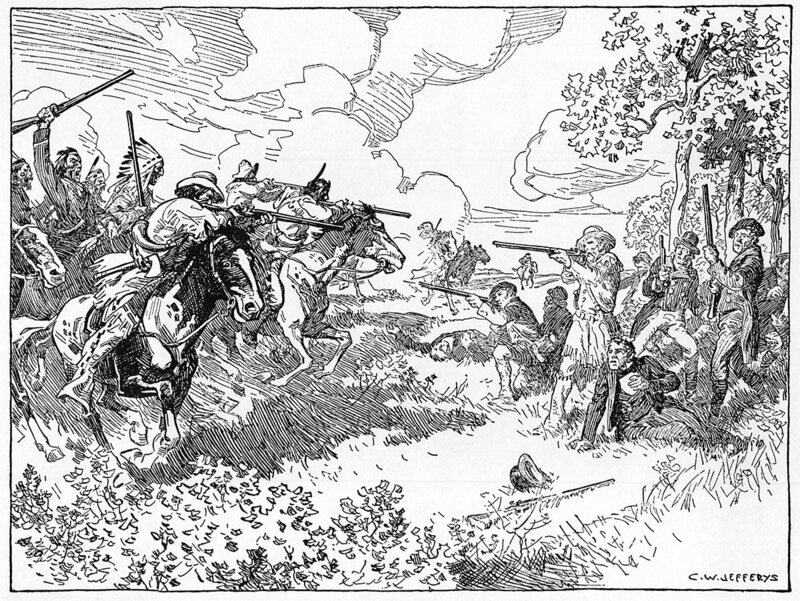 The Nor'westers and their Metis (FrenchIndian), hunters and trappers, fearing that settlement would destroy the fur-trade, opposed Selkirk's scheme. They harassed and drove away the settlers, demolished their buildings and almost exterminated the colony. 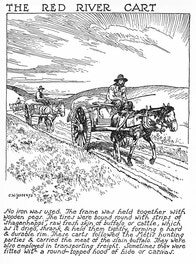 Early in 1816 a body of halfbreeds from Qu'Appelle and Portage La Prairie gathered for a raid on the settlement. On June 19th they approached Fort Douglas and the Colony Gardens. 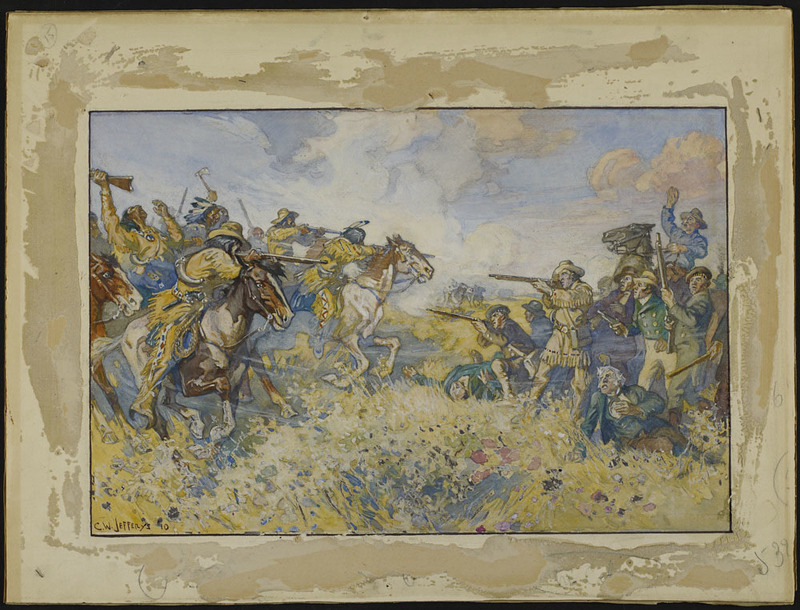 Governor Semple led a party out from the fort to intercept them. Semple's party was attacked, and all but six were killed. The total number killed was twenty-three, among them the Governor, his secretary, a doctor and a surgeon. The site, on the northern outskirts of the present city of Winnipeg, is marked by a monument. The story is told in The Red River Colony, by L. A. Wood, in the Chronicles of Canada Series, and in works by Alexander Ross, George Bryce, and Professor Chester Martin. Mine Inheritance, a novel by Frederick Niven, gives an accurate and vivid picture of the time. Newman, Peter C. Empire of the Bay. Toronto, Viking Pess, 1989. 223 p. Illus. p. 125 Seven Oaks Massacre by C.W. Jefferys, National Archives of Canada (C-73663). Lanktree, Graham. “Profit and Ambition.” Text. Canadian Geographic, July 27, 2015. https://www.canadiangeographic.ca/article/profit-and-ambition. January 31st, Lucy Martin on, and 2015. “A Moving Response to Charges of Racism.” The In Box. Accessed July 20, 2017. https://blogs.northcountrypublicradio.org/inbox/2015/01/31/a-moving-response-to-charges-of-racism/. Library and Archives Canada Blog. “Guest Curator: Adam Gaudry.” Library and Archives Canada Blog, July 20, 2017. https://thediscoverblog.com/2017/07/20/guest-curator-adam-gaudry/. 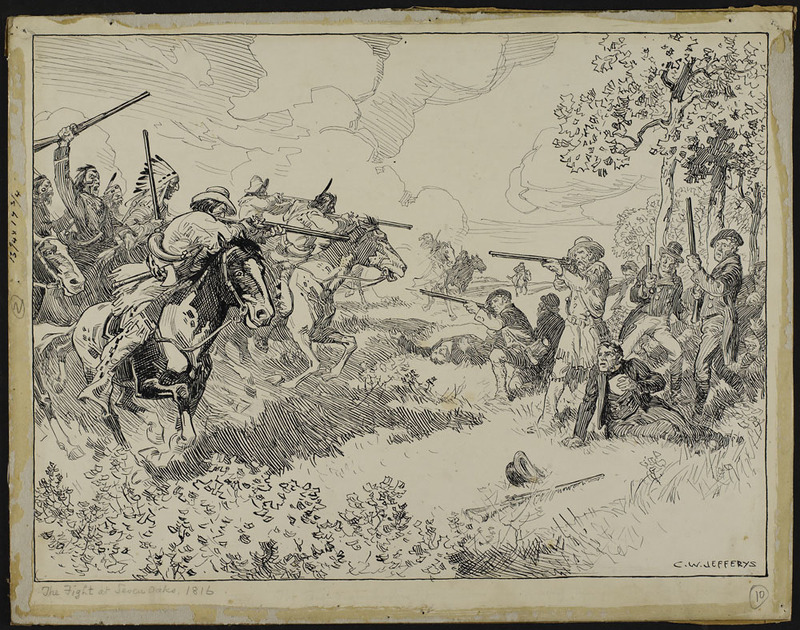 “Battle of Seven Oaks.” Wikipedia, July 20, 2017. https://en.wikipedia.org/w/index.php?title=Battle_of_Seven_Oaks&oldid=791398572.